Khun Thanat from Thailand hand carves this lovely African giraffe figurine entirely from reclaimed coconut shells and wood. Afterwards, she meticulously finishes them with paint and fine wood detailing. 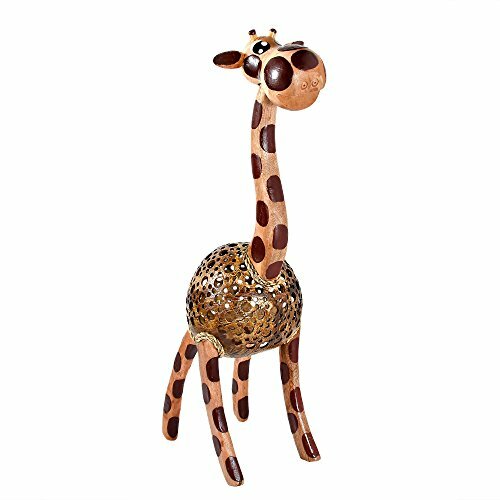 Charming and cute, this figurine is great as decoration for just about any room in the house including bedrooms, bathrooms and playrooms and is also a unique gift to children and giraffe and wildlife enthusiasts. PLEASE NOTE: The handcrafted nature of this product will produce minor differences in design, sizing and weight. Variations will occur from piece to piece, measurements may vary slightly. Packaged in AERAVIDA branded environmentally sustainable packaging. ARTISAN STORY: Thanat has been drawing inspiration from the rich cultural heritage of his homeland to express his artistic talents for nearly ten years. He has a small workshop in Northern Thailand, where he and other family members practice their craftsmanship. At his workshop, only manual tools are used which helps achieve finely detailed work and artistry.